Great Designers / Franco Lambertini, "MISTER V". Face to face with the well known designer from Bologna, Italy, creator of the V-twin engines, which were typical for Moto Morini for more than 20 years. Freewheeling, he tells us about his long career, full of "juicy" background stories and about a dream, which he would like to materialize. 350cc V-twin. At the moment, Mr. Lambertini is technical director at "Franco Morini Motori" (since 1999 the owners of the brand-name "Moto Morini"). If today "the boss", Mr. Alfonso Morini, were still alive, he certainly would be a happy person, firstly because (although for some years grass and weeds are growing at the center yard of his company), his motorbikes have left a deep impression and secondly, because the name "Moto Morini" is still able to create a lot of emotion amongst many. "The commendatore" (the boss) would have no regrets, because, as long as he was active at the factory, the company always followed the route, which HE had choosen: building motorbikes which were simple, reliable and user friendly. The fact that the name Moto Morini reached such an important level in Italy, is in particular thanks to Franco Lambertini, both a capable and competent technician, as well as a friendly and open person, who placed sincerity atop of his lifestyle. It is a fact that Lambertini has interpreted - in a modern way - , the essence of the motorbikes built by Alfonso Morini. He always stayed loyal to the philosophy of the "casa Bolognese ("house of Bologna"): simple, reliable and fast. At Moto Morini he also was an innovator who used the lastest schedules and latest technical solutions, which were way ahead of time, even ahead of products from Japan. By Alberto Pasi and Vittorio Crippa. "Motociclismo d'Epoca, September 2002". Franco Lambertini was born in January 1944 in the area of Modena. At an early age he inhaled "the air of engines" and chose to study precision- and fine technics. In 1961, after a fierce apprenticeship as a mill operator and technical draftsman of gearwheels and presses and other mechanical tools, he was hired by Ferrari, where he worked in all sorts of departments, like the departments of engines, gearboxes and even car chassis. 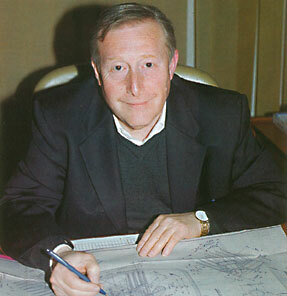 Here he perfected his education as a designer-technical draftsman. The experience at Ferrari was deteminative, because he grew while co-operating with the best designers. So in 1967, and with the enthusiasm of his only 23 year old mind, he left Ferrari for the small factory of sport- and racingcars "MWM" from Modena. Immediately, he became "chief-designer". From his efforts, a Sport-Prototipo (prototype) 3.000cc was born with a V-8 engine and an angle of 90o between the cylinders. For this car, he also made the design of the selfsupporting (monocoque) chassis. This car was used - with good results - by the "Scuderia Serenissima" (from Venice), in various races. In 1970 Lambertini joined Moto Morini. Although only 26 years of age, he was appointed to "principal of the design department". In 1972 he landed even a step higher on the ladder at Moto Morini and became "Technical Director". The efforts of Lambertini at Moto Morini, rise above the heavy task of Chief-designer. The factory from Bologna found itself in a crisis in the second half of the 1980s (Personal note: because the home market for motorbikes collapsed - CV) and this lead to the takeover by "Cagiva". Lambertini tried to find financial support from the Italian government, (to save the company) and designed a motorbike, powered by a V-twin engine, with both air- and watercooling and cylinderheads with four valves. This new engine can be made in various versions between 350 and 750cc. Unfortunately, this engine was put aside aside by Cagiva. 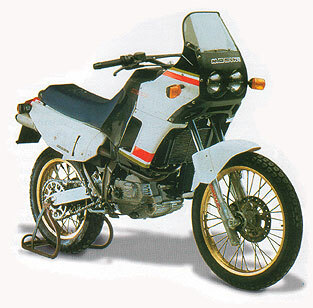 By then, Cagiva had become the owner of the company from Bologna. Some pictures of the "car past" of Franco Lambertini. 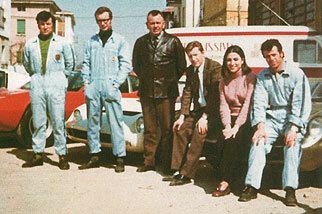 He started in 1961 at Ferrari and finished in 1969 at "Scuderia Serenissima". His "Sport Prototipo"
can be seen here at the start of the GP of Austria in 1969. 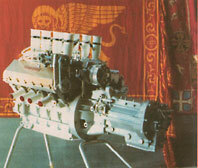 The 3 litre V-8 engine (400hp). 1) The name Ca-Gi-Va, stands for: Castiglioni-Giovanni-Varese, a relatively new company which had taken over the motorbike department from "Aermacchi H.-D." - CV). 2) Ca-Gi-Va first started producing suitcase locks and went into motorcycle business after Giovanni's sons Claudio and Gianfranco, themselves motorcycling enthousiasts, entered the racing world by sponsoring young promising italian riders like V. Ferrari, etc. Years later they entered the motorcycle production market by buying the Aermacchi H.-D. factory - AP). Venice. He also had Ferrari's and Maserati's. 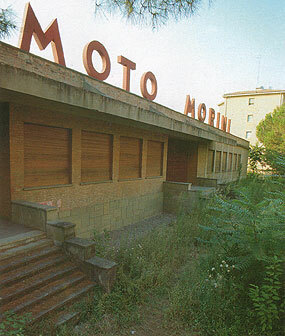 In the year 1989, Lambertini felt that the end of the glorious brandname Moto Morini was near. He took the offer of Piaggio (Vespa) to become the director responsible for the department of "engine design", a separate company within the Piaggio conglomerate. Under his management, various engines were introduced for all kinds of scooters, like a 50cc, 125cc, 150cc, both two stroke as well as four stroke engines, both air- and watercooled. Also a 1,000cc twin-engine and many gearboxes for motorbikes which never made it into production, or was put aside by the marketing department of the company. Very important is his involvement with training and education of the staff of Piaggio. In the year 1995, he was appointed to "Responsible for the Motorbike- Platform", a department with the aim to harmonise the design, development and production of engines, so production can be smoother (Piaggio is a very large company). Today Lambertini works for "Franco Morini Motori", again with the same tasks. At Franco Morini Motori we pay him a visit to spend a pleasant day with him. In his office, which is plainly furnished, he is working on calculations to check the quality of the 900cc triple cylinder engine of the new Benelli motorbike. Benelli has entrusted the essembly of all mass-production engines to Franco Morini Motori. 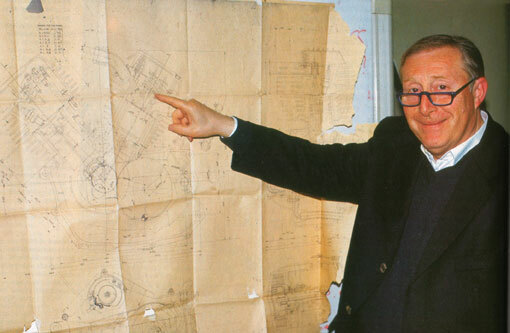 On the wall in his office we notice a large drawing of a V-twin engine. We will discuss the V-twin engine with Lambertini. Our interview starts with his car-history, which educated Lambertini as a technician. As we have been friends with him for a long time, we take the liberty to speak to him in an informal manner and we will proceed that way, during the rest of the interview. Q: Often it is claimed, that car-technics and motorbike-technics are not compatible. What can you tell us about this, as you had your first experiences at Ferrari? A: Yes, they are two completely different worlds, besides, Ferrari is unique in it's world. In Maranello I really learnt a lot, particular on the mentality. In the car industry, especially in the field of racing, one aims for maximum technology and all the time experiments are made with new ideas. In car racing it seems like there are unlimited funds, whereas, when developing a vehicle for the public, one has to carefully take the costs into consideration of the technical solutions, which are choosen. Q: How did you end up with Moto Morini? A: When the Scuderia Serenissima was cancelled, I started looking for another job. In the newspaper I saw an advertisement of Moto Morini, who were looking for designers. So I applied. They had me do an assignment on the engine of the Corsaro and so I was hired. Q: What was the atmosphere like, when you started at Moto Morini? A: It was an atmosphere soaked in an enormous passion. 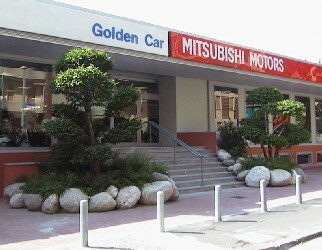 Mr. Marchesini was working there, the Director of the Technical Department, which was very good. Also Arnaldo Mastrangelo and especially Dante Lambertini, to whom I am not related. Also many others, who were really living for Moto Morini. When I applied to them, they had me do a technical exam, before I was hired. So I drew the "flat head" for the Corsaro Regolarita. With this modification, the engine produced 18 hp at the rear wheel. Now I can say that, although only 26 years of age at the time and although I hardly had any experience regarding motorbikes, my ideas were taken very seriously. Q: Tell us about your "masterpiece", the 350cc V-twin. A: It was born not so much later, than the time when I started working for Moto Morini, so at the end of 1970 to be more precise. We were convinced that Morini could not continue with the Corsaro as the only trump. Morini had to build a motorbike, which was up to it's time, but it also had to fit in our tradition. Moto Morini was a small firm and we had to attend the costs. We then got the idea of a medium-class bike. Our thoughts went out to a bike, which had to be light and compact, with good handling. It also had to have good performance. 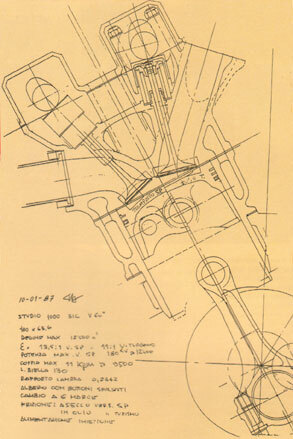 I was convinced that the best structure of the engine (not only to get optimum proportions between the frontal and lateral sizes), but also from an aesthetical point of view, was the small V with an angle of 72o in linear direction. 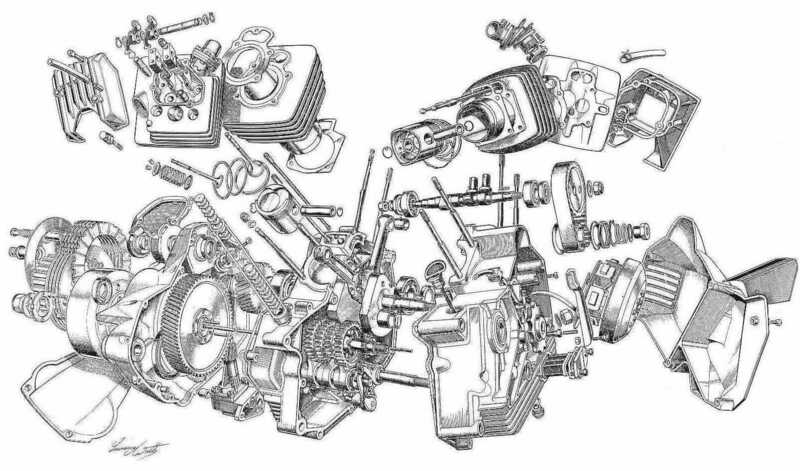 Such an engine is only slightly wider than a single, because both cylinders stay within the profile of the motorbike. It also offers the chance to shape the header pipes properly. In order to get proper cooling for the rear cylinder, I put both connecting rods next to each other on the crankshaft and not like "twins",such as Harley- Davidson. This way, the rear cylinder is not in line with the front cylinder, but 5 cm (= 2 inches) out of line. The rear cylinder catches more air to cool. Apart from that, the legs of the rider form a sort of deflector, which sends the wind, when riding, to the rear cylinder. Furthermore I shaped the header pipes (to the mufflers) in opposite directions to prevent that the collector of the rear cylinder ending up in the hot air of the front cylinder. This way, even under very heavy conditions, the temperature difference between both cylinders is limited to a maximum of 15o C, but in some cases, it appears that the rear cylinder is even cooler than the front one. I am still convinced that the "narrow V-twin" is the best possible engine for motorbikes. Our work went so well at the time and without big problems, that we were able to show a prototype at the Milan motorbike show of November 1971. Q: In the beginning of the production of the 3� there were many problems with the connecting rods. How come? A: The connection between the conrod and its head wasn't precise enough, there was a small difference of 3-4 hundreds that escaped the checks. The tension created for this reason on the connecting bolts first produced a bending stress and finally broke them, with all the consequences. This problem appeared on the first 200 to 250 engines, which all came back to us: damaged. For this reason, it was nearly impossible to find the cause of the damage afterwards. After a closer, more thorough investigation of all new parts the problem was finally discovered. We changed to a different supplier and the problem was solved forever. Q: One has always claimed that at Moto Morini there was very little money for new investments. Did this influence your work a lot? A: When I started work on the 350cc engine, I was told with emphasis to reduce the cost to a maximum. That was the reason why I choose certain solutions, instead of others. In 1972 the total cost of the complete production line of the 3� was reduced to about 600 million Italian Lira. (personal remark: at the time roughly Euro 450.000 - CV). It does make sense: lower cost of production also mean a sharper price for the buyer, even for spares. Lower cost of production also means a stronger position on the motorcycle market in respect to competitors. Reduction of the production costs should not influence the quality of the product and I am convinced that Moto Morini, in this respect, never let it's customers down. After Moto Morini ing. Lambertini worked for Piaggio. Here he worked on several projects, like the scooter "Sphera". At Piaggio he also disigned a 1.000cc V-Twin for a heavy Gilera. Q: But still, in the last years it was clear that at Moto Morini too much cost- reduction was achieved. worked on the development of a 125-150cc 4-stroke engine for a scooter on behalf of "SYM". On the photo, Lambertini stands next to Mr. Fabio Taglioni of Ducati. Lambertini always admired Mr. Taglioni in all working fields. Lambertini's greatest inspiration was Colin Chapman of Lotus. A: Yes, but this was typical for all small factories, who had to calculate at night to see if the factory-doors could be opened again the next morning. This was also the case at Morini. We had to count up to the last Lire but still, everytime we were able to pay our suppliers in time, without ending up in red figures. Sometimes, the financial circumstances brought us into funny situations, which can still make me smile, up to today. 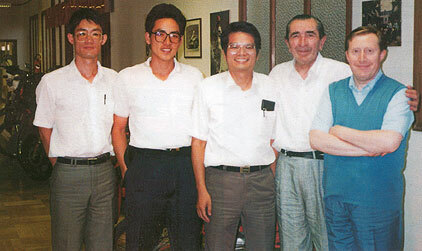 Like the time when we were busy developing the 500cc engine. In the morning I came in to the workshop where I had put the second prototype together (after lots of arguments) and I saw that a few men were busy loading this engine into a van. So I asked what there was going on and I got this answer: "But�did you not know about this? � We sold the engine to the British importer ! �" Without getting angry I asked how they would supply spares, as by then, nothing on the engine was registered in a technical drawing. And so, we kept the prototype in the factory for a little while longer, for further development. A: Yes, I had choosen a few, for that time, very modern solutions. The heads are flat, according to the "Heron" principal with the combustion chambers in the pistons and parallel, straight(standing) valves to prevent problems when valves and pistons would hit each other. Both intake and outlet ports were developed very carefully to get a maximum turbulence in the heads. And, precisely, machining these channels caused us problems in the beginning, because the apparatus, which had to machine the channels was not able to do so according to the technical drawing. So we missed 2 or 3 hp. The funny part is that it took quite some time to discover what caused the problem. For the timing gear, I choose a rubber toothed belt. I was the first to use this on a motorbike. In the beginning I even had to overcome the mis-trust of Pirelli, because of their fear, due to the short length the belt would last only shortly. But when we had an engine testrunning, it appeared that the rubber belt lasted more than 200 hours. Later, when the kevlar belt was introduced, the problems were solved for good. An unknown prototype of 550cc with 60 hp., based on the 501 (507cc) engine. It was made at the end of the 80s. The project was cancelled by the Board of Directors of Moto Morini. The engine was very modern with hydraulic valve management and 4 valves per cylinder. It had liquid cooling, special heads cylinder heads: the inlet valves were under an angle of 11o and the outlet valves were under a 15o angle. 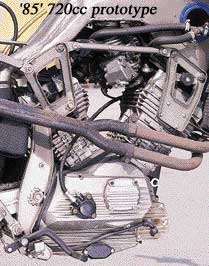 When Cagiva took over Morini, the engine was degraded to aircooling and also the bore x stoke dimensions were changed from the original 78x57 mm to 73x65mm. 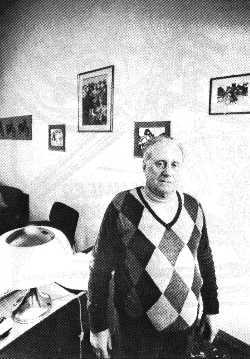 Mr. Gianni Marchetti, Moto Morini's Managing Director in the 70s and 80s. The camshaft is located in the "V" between the cylinders, at the highest possible place in order to keep the pushrods as short as possible. Further a 6-speed gearbox to get the maximum out of the engine, a solution only very few streetbikes had at their disposal at the time. An electronic ignition, specially developed for us by "Ducati Elettronica", to make the ignition free of maintenance and to always have a strong spark under all circumstances. Deliberately we choose a wide range of pre-ignition (from idle to maximum rpm) to make starting of the engine easier. Q: Why did you not supply the engine with a modern electric starter-engine straightaway? A: Originally I must say, the engine, was drawn with an electric starter, but our administrator, Mr. Marchetti, who had to run the company in good and bad times decided to cancel the e-starter to reduce the cost and also, because to his opinion, a real motorbike rider, would not appreciate an electric starter. On the other hand, like I said, the wide range of pre-ignition made that the engine would always start easily, with one or two kicks only. 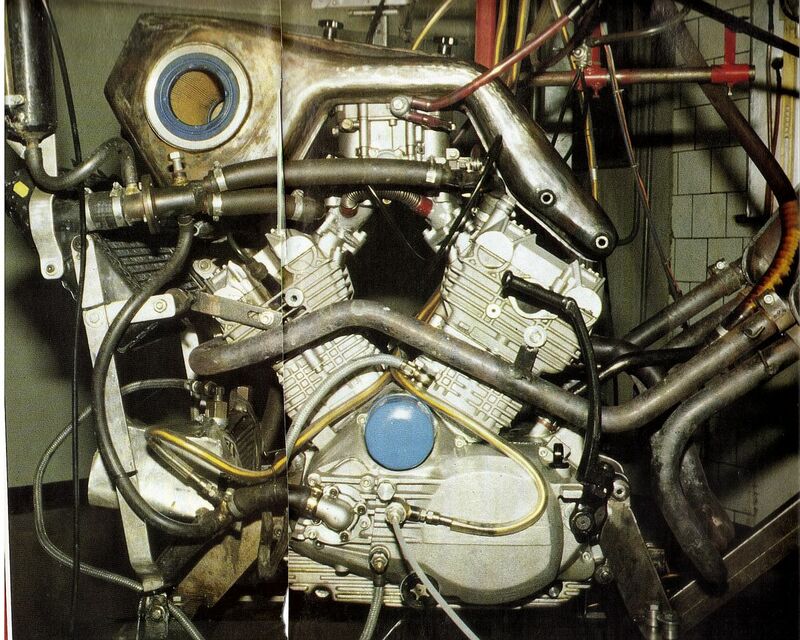 A study of the 1000cc V-twin from the year 1987. Angle between the cylinders: 60o. Q: What were the further developments of the 350cc? A: Later, when e-starters were more common on motorbikes, we also assembled them, but to be quite honest, that system only caused problems, because it became a emergency solution. Also the choise to fix the gearlever on the left was made later. From the beginning, I had drawn all parts of the crankcases with the gearlever on the left, but then I had to re-make all drawing mirrorwise. It cost me an extra week of work, but Mr. Marchetti decided that "Morini-customers" were used to the gearlever on the right side, � and there it had to stay !!! A: In the first place the the 3� Sport. 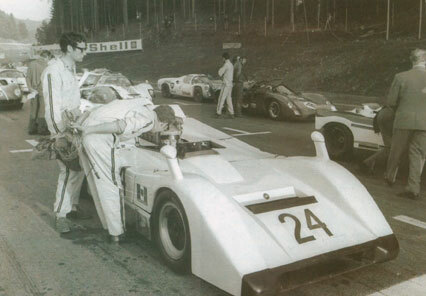 In the beginning the engine of the Sport was different to the standard engine on various points. The camshaft was "hotter", the pistons were lighter and the compression was higher. But, because of frequent errors and interchanged parts at the production department, we built only one type of engine later. This meant that the difference in performance between both models was owed to the better aerodynamic position of the rider on the 350 Sport. The first Sport, the one with drumbrakes and spoked wheels, was the best model with her performance versus weight. Later models with disc brakes and light alloy rims were never able to match her performance. 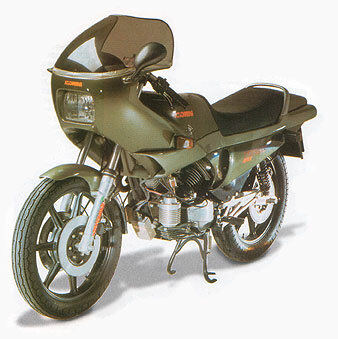 Another bike, which I always thought was good, was the Kanguro 350, because it was a light and very well handling machine; it went everywhere and aestetically it was a very good model. Between all the engines, the 250cc was the best and most balanced of the whole series. We had to develop this model especially for the French market, as this engine capacity was not penalised by taxes in this country. The most "juicy" engine was the 501cc, which showed a fantastic torque. In these series of engines, modularity was total: the casts of all parts of the crankcases was the same. It was easy to switch from "mono" to "twin", simply by adding a special closing part in the cast, so a hole appeared in the crankcase for the rear cylinder. Also the connecting rods were the same. The ducts inside the head of the 125cc were the only difference compared to the head of the 350cc. ; the oilpump only had a different neverending screw and helical leading gear. There were more parts identical, like the same gearbox for the 350, 250 and 125cc engines. Q: But some technical choices were at least strange. Why, to name one, was a dry clutch used? A: Yes, I know a dry clutch is harder in use and can be dosed less. Mr. Marchetti decided on this, firstly, because it gave a sportive image to our bikes and secondly, because the engine has not got an oilfilter that can be changed, but only has a mesh- filter. Such a filter is not capable to stop all pollution, coming from a wet clutch. Furthermore, a dry clutch has got smaller dimensions than a clutch in an oilbath. Apart from this dry clutches are still used successfully in racing and Moto Morini was always orientated in this direction. A: One should consider well. The 500cc always was a splendid engine for me, but one expected more difference in performance compared to the 350 engine. I should say, it probably was possible to get some extra hp from the 500 engine, but at Moto Morini we did not want to take any risks. More than the performance, we wanted to emphasise the reliability of the engine and guarantee this to our customers. Finally, the extra VAT taxes of 38% (in Italy) reduced the numbers of sold motorbikes a lot. (Personal note: Motorbikes above 350cc in Italy had to pay the heavy 38% VAT (tax rate). That is why you still find many bikes for sale in this class, instead of the lighter types. You will find many Guzzi's V35 instead off V50, many Ducati Pantah's 350 in stead off 500, more Morini's 350 than 500 and even Laverda's 350 - CV). Q: So far, we only spoke about technique, but Morinis were also appreciated because of their plain, but well balanced appearance. Who drew the styling of the various models? A: We never had a design-department and, because of my origin from the car- industry, I would have liked more straight lines for the 3�. But I was aware of the fact that bikeriders would not have liked these straight lines. Mr. Marchesini drew the K2 and I drew the 250 twin. We looked more at functionality on the whole, as on aesthetics and that was decisive at the final shaping of the bikes. Q: Why did Moto Morini remain an Italian phenomenon and why did it not - in time - expand on the international markets? A: Again, only a matter of money. To be able to sell in foreign countries one should have created a decent network of dealers; one should have a branch office, which can handle the market in question. But that costs a lot of money and we did not dare to risk it. So our export was in the hands of only a few individual dealers who - naturally - could not do more than they did on their own. Every year, Franco Lambertini joins the meeting of Moto Morini Club Italy. Q: To give our readers an idea: what was the production-record of Moto Morini in one year? A: In times of maximum success of the 3�, we did reach numbers of 5,000 up to 5,500 built and sold bikes per year. Q: Now the chapter about the "500 Turbo". Could it have become the key of succes for Moto Morini? and the weight I put the solution of a "volume compressor" aside and I started looking for a turbocompressor. In the begining we experimented with a "KKK" turbine, but this unit was too big. But one day, a friend of mine told me that he had discovered a very small turbine at the agricultural exhibition in Verona. It was an "IHI" turbine from Japan, imported by a firm in Caserta (near Naples). I phoned them and they brought me into contact - very friendly - with the Japanese. Strange enough, the "IHI" told me that the turbine was still a prototype and they asked me why a motorbike factory would be interested in such a turbine. They wanted to know from me where I would mount the turbo on the motorbike, what compression from the turbine I was thinking off, what average temperatures, what the right adjustment of the distribution phases would be and with what compression ratio. The Moto Morini 500 Turbo (prototype). Of course, I became suspicious and in my answers to the Japanese, I deliberately sent some wrong parameters and information. Their answer was that they would contact us at short notice. At the same time "Alfa Romeo Avio" offered us a turbo, which, perhaps, would have been right as well. But the time passed and nobody turned up; not from the Far East and not from Italy either. And so, from the beginning two years had passed by and we had a few bookshelves full of papers and documents, but in concreto, we had nothing ready. 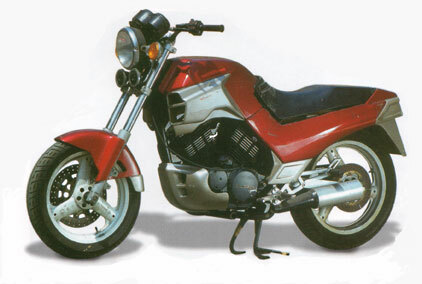 "By chance", two months after Honda introduced the CX 500 Turbo, the positive answer came from Japan, that they were prepared to sell us the turbocompressor. But in the mean time, we found out that the IHI Company also produced steel forging- and cutting presses and that they had close commercial relations with Honda. These are the final facts; I leave it to you to judge it. We presented the 500 Turbo at the Milan exhibition in 1981 and also during the MotorShow of Bologna. It was a fantastic bike with many progressive features, like the muffler pipes underneath the buddyseat, a solution which is used a lot these days, but we applied it first. But the time, which had passed by from the beginning of the development, the high cost and an excessive restraint at Moto Morini, finally led to the canceling of the whole project. At those two shows, the people were lined up to admire our 500cc Turbo. In any case, the publicity of this bike brought some advantage for our make in a difficult period in relation to the numbers of sales. The "turbo effect" caused our depots to empty of all the unsold stock of production of a whole year. That was good, because production had gone down to an absolute minimum, amongst other things, caused by various strikes at the factory. Apart from that Mrs. Gabri�lla Morini, the daughter of the "Commendatore", got very tired of all the tension between the Unions and the Board of Management of the company. 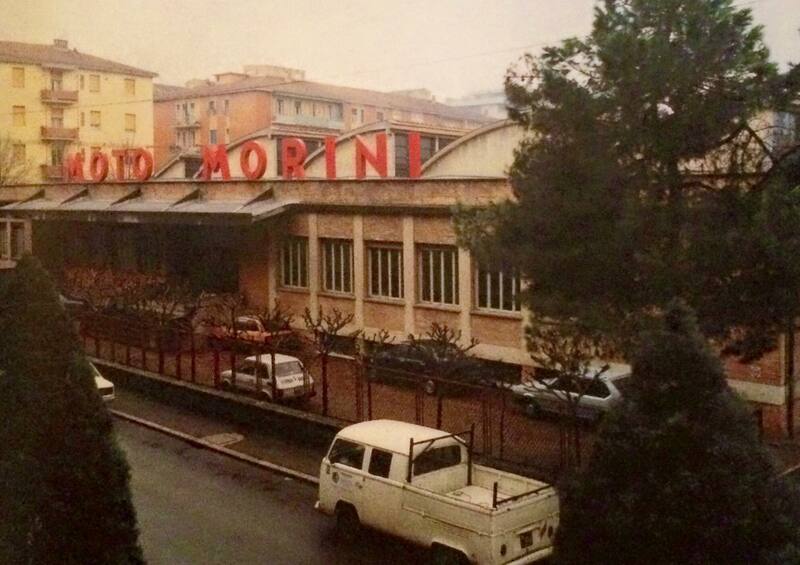 Taking into considerartion that only few years before, working at Morini was seen as a privilege in Bologna and surroundings and also that the company was seen as one "Big Family". But unfortunately, the circumstances had changed and it has - in my opinion - led to the sale of the company to the Castglioni Brothers (Cagiva). Q: You were talking about excessive restraint at Moto Morini, what do you mean with that? A: Very simple: the Board of Management mainly had people at age. These people had seen the crisis of the 1960s and so, for every decision about a new investment, they wavered at least ten times. Besides, the 125cc four stroke did not sell as well as we wanted. We never dared to build a two stroke, which was very much the fashion in the 1980s. This was a choice of conscience for us, but we were not rewarded by the market. But, although the technical discussions during meetings were really fierce, the co-operation between us all, never ceased. That is why I was always very associated with Moto Morini. They gave me, at all times, always complete trust, by backing up my choises with a completely correct attitude towards my person, under all circumstances. That is why I turned down all offers, made to me from all sides. I only left Moto Morini - at the time already owned by Cagiva - when it became clear that they wanted to close down Morini, because new, necessary investments were lacking and because my new V-twin engine was cancelled from their production plans. I sincerely believed in the project, so much so, that I personally seeked for government subsidies, based on Law nr. 46. The whole motorbike was very progressive: the monocoque (self supporting frame) was made of pre-shaped (pressed) steelplates with the rear-fork hinged in the engine. The engine itself was working on the test-stand, with excellent results and also with excellent prospects. But then Cagiva came with the story that there was no money for further development and that they had plenty of engines already. So I took the offer of Piaggio and left. Q: Can we believe in a resurrection of Moto Morini? A: At "Franco Morini" such an intention is present, but it is a very important step. One should be prepared to make large investments and work for 2 to 3 years without a profit. That is why they are presently looking for a suitable partner to realise these plans. Q: How would you like to see Moto Morini in the future? A: One should take "advantage" from the "emotional forces" which the name Moto Morini, with her tradition, can still mobilize. Than a first-class product should be released. A "naked bike", with a V-twin engine between 500 and 750cc. Natural, simple, compact, economical to build, to sell, in use. A motorbike with a very defined "character". So, a bike like my 3� of 30 years ago. Q: The drawing, which we saw hanging on the wall when we came in, should give you (the readers) a hint in the right direction???!!! The "happy ending" of this story was of course the official ressurection of Moto Morini and the launch of the new models Corsaro 1200 in 2004 and 9� a year later. Remarkable fact: the V-1200cc engine of the new Corsaro (and 9�) was -- again -- designed by Franco Lambertini!! This interview dates from September 2002.
took place in the Ducati factory - TK). (Dutch) Tony Kersbergen (TK), Dutch to English & co-ordination. You can download the original interview - in Italian - from this site as a .pdf file (1.8 mB). On this website you can also read an older interview with ing. Franco Lambertini (1999). Special thanks to Mr. Carlo Perelli of MotoCiclismo d'Epoca, who granted permission for publication of this internet version of the original article.